National Trail’s Kayleigh Minner helped the Blazers to a 10-0 win over Twin Valley South on Tuesday, May 1. The Blazers went 2-1 last week to improve to 10-5 on the season. 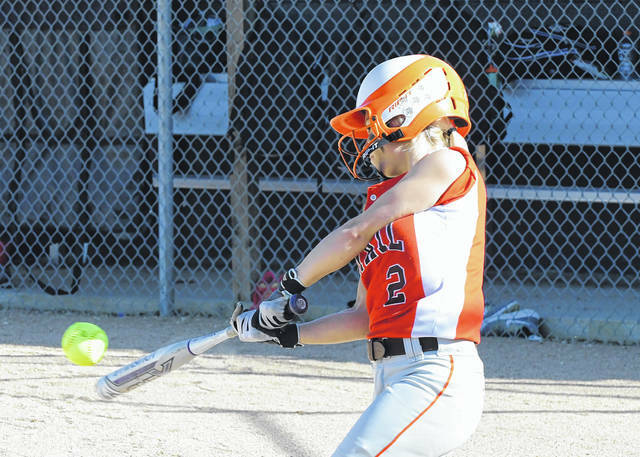 NEW PARIS — National Trail’s softball team went 2-1 last week knocking off Twin Valley South and Arcanum, which was tied for first in the Cross County Conference entering the game. The Blazers dropped a decision to Franklin-Monroe to begin the week. Against TVS, Molly Skinner pitched a complete game, striking out nine batters, en route to a 10-0 win over the visiting Panthers on Tuesday, May 1. Trail scored twice in the first and second innings to take a 4-0 lead. The Blazers scored six times in the bottom of the fifth to end the game. Gracie Jones went 2-for-3 with a double. Davlyn Werner was 2-for-3 with a pair of singles and two runs scored. Bobbi jean Grimes added a double and two RBIs. 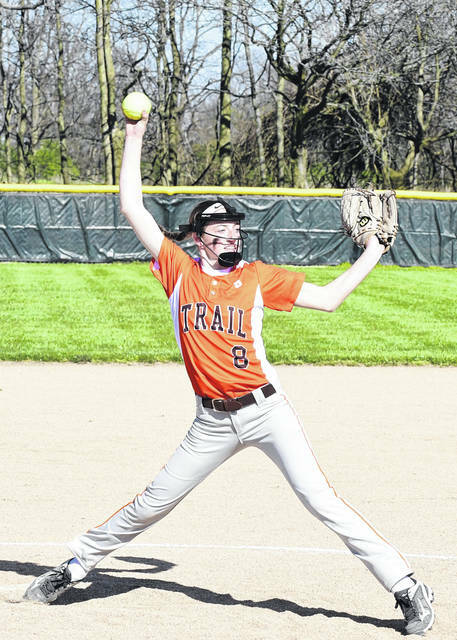 On Thursday, Trail upset Arcanum 8-5. Trailed opened the game with four runs in the top of the first. The Trojans responded with three runs in the bottom of the first. Trail added two more runs in the second to take a 6-3 lead. Arcanum scored twice in the bottom of the fourth to make it 6-5. An inning later, the Blazers responded with two runs of their own for an 8-5 lead. The Blazers were led by Savanna Abner, who went 3-for-4 with a home run. Makena Laird was 3-for-4 with a double. 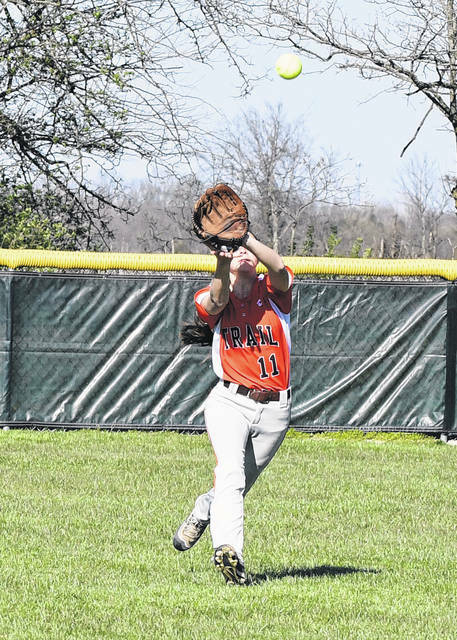 Trail suffered its only loss of the week on Monday, when it fell to Franklin-Monroe, 4-3. Trail opened the scoring with a run in the second. F-M responded with a run of their own in the bottom of the second and added two more in the fourth and another run in the fifth. Trail rallied to get within 4-3 in the sixth and had the tying run on second base in the seventh when the game ended. Offensively, the Blazers were led by Lauren Sargeant, who was 2-for-2 with a double and a run scored. Werner went 2-for-4 with two singles. Kayleigh Minner had a run scoring double. Trail (10-5, 7-4 CCC) was scheduled to play Tri-County North on Monday, May 7, for its final regular season game of the season. https://www.registerherald.com/wp-content/uploads/sites/41/2018/05/web1_ntsb1.jpgNational Trail’s Kayleigh Minner helped the Blazers to a 10-0 win over Twin Valley South on Tuesday, May 1. The Blazers went 2-1 last week to improve to 10-5 on the season.